Dubai, UAE, June 04, 2018: We all know that a perfectly painted pout can help pull any look together, especially when done using a vibrant and matte liquid lipstick. However, liquid lipsticks have the reputation of being unforgiving on the lips, as they can feel drying and accentuate any lines or textures on the lips. 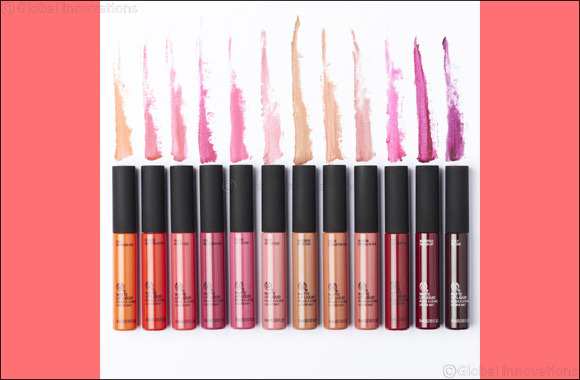 Introducing The Body Shop’s Matte Lip Liquids, the creamy matte lip liquids with a mango fragrance that provide intense colour with a velvety matte finish without the drying feel. The Body Shop Matte Lip liquids contain high purity pigments, which give a strong colour pay off. Enriched with two nourishing Community Trade ingredients, which help to create a moisture barrier on the lips, keeping them smooth and soft. The first Community Trade ingredient is beeswax to help protect and condition lips – while the second ingredient Marula oil (from Namibia) has smoothing properties and helps the product to glide on the lip effortlessly. The lip liquids are formulated without gluten, carmine, mineral oil and petrolatum and they are suitable for sensitive lips. These are also available in 17 highly pigmented and vibrant shades that will stay on your lips all day. The Body Shop Matte Lip Liquids are priced at AED 52 and available for purchase in all Body Shop stores across the GCC.